Underused and under promoted, Spyridium species make excellent garden plants, however seem to have fallen out of favour with landscapers. Plants from the genus can be found in South Australia, Victoria, Tasmania and New South Wales in Australia and is often referred to as ‘Dusty Miller’. S. obcordatum is ‘Creeping Dusty Miller’ and is found in Tasmania. 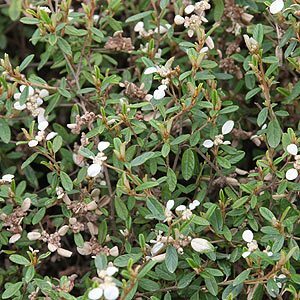 It is the low growing ground cover varieties that seem to attract the most attention from gardeners and this versatile group of plants has a lot to offer the landscaper. 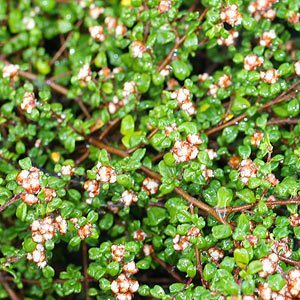 Small glossy green foliage with pink and white flowers and a low growing habit make species such as S. obcordatum (pictured right) which will flower in winter, an interesting choice as a ground cover plant. A little bit of historical investigation shows that Edna Walling used the many of the species in her landscaping as a ground cover plant. And we have the cultivar named after her. The flowers of ‘Dusty Miller actually grow in clusters and the foliage is a dusty white color, almost as though it has been sprinkled with flower, hence the name ‘Dusty Miller’. S. vexilliferum is called the ‘Winged spyridium’. S. gunnii is from the Dandenong Ranges. Some species such as S. coactilifolium grow well in coastal areas, these species could be well suited to gardens in exposed coastal areas. All require a well drained soil and good sun to grow well.